You'll be £25.00 closer to your next £10.00 credit when you purchase Captain Elliot and the Founding of Hong Kong. What's this? Who was Captain Elliot, and how did he find himself at the centre of this debate? 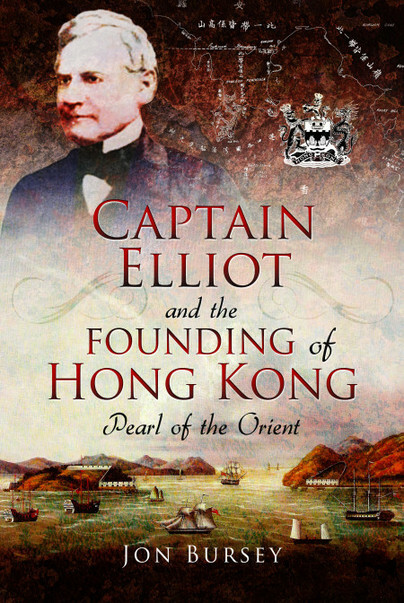 This book traces Elliot's career from his early life through his years in the Royal Navy before focusing on his role in the First Anglo-Chinese War and the founding of what became the Crown Colony of Hong Kong. Elliot has been demonised by China and for the most part poorly regarded by historians. This book shows him to have been a man ahead of his time whose views on slavery, armed conflict, the role of women and racial equality often placed him at variance with contemporary attitudes. Twenty years after the return of Hong Kong to China, his legacy is still with us. The title of this work has clearly been constructed to hang it to what remains a unique and attention-grabbing territory and consequently the most publicised events of Elliot’s life. This foreshortens the author’s offering which illuminates the whole life of the man, including aspects of his background important in shaping his attitude and views (some surprisingly advanced for the time) but frequently omitted from historical studies; and vignettes of rarely glimpsed aspects of British colonial policy, diplomacy, and even penal and Royal Naval appointment practices, across the mid-nineteenth century. The five chapters (of nineteen) covering the four years of Elliot’s China posting and the inquest on its outcome describe his rapid promotion from the fifth to the top tier of the government organisation established to superintend trade with China following the withdrawal of the East India Company monopoly. The tensions between commerce and conflicting government instructions and an energetic man and inadequate colleagues, before a backcloth of constantly crossing communications across a five month barrier of delay, are finely drawn. More than one hundred years later the description of misunderstandings between the British and Chinese authorities remain instructive and make a powerful inducement for purchase of the book by those engaged in business with China today. If a better understanding of Anglo-Chinese negotiation then informs negotiations today so also does a contemporary view of aspects of the chapters covering Elliot’s subsequent appointment as Consul General to the then independent Texas. The negotiations with Mexico and the US against the ever-present strength of the British interest promote considerations not irrelevant to the current Presidency. The two prominent appointments of this public servant’s life come gift-wrapped with discoveries from Guyana, Bermuda, and even St Helena. An impressive depth of historical research delivered in accessible and enjoyable style. This volume is well written and researched. Being biographical in nature it may appeal to readers seeking a straight ‘adventure’ story. It may also be useful to historians interested in the Nineteenth Century Royal Navy. Historians researching British Imperial Policies and actions during the same century may well find it worthy of their attentions, while those seeking in-depth historical data on locations such as China, the ‘British’ Caribbean and the Republic of Texas may also find it of interest. Jon Bursey was educated in the UK and Hong Kong. After reading Classics at Durham he followed a career in university administration, becoming Academic Registrar at the London School of Economics and Registrar and Secretary to Council at the University of Bath. He is retired and lives in Wiltshire.